I want to begin by telling you about my friend, Curtis. Curtis is a free spirit, spontaneous in a way that unfortunately landed him in jail more than once. Always vowing to think before he acts next time and someday, someday, he is going to make it. But I met Curtis in the ND state penitentiary. One evening he was reading the Scriptures for Mass. As he came to the conclusion he said "the Word of the Lord....well actually, chaplain, not all of the Word of the Lord cuz I skipped some of the hard names. Is that okay?" I answered, "It's okay." He straightened up and proclaimed, "The Word of the Lord, just not all of it." And as good Catholics, we responded "Thanks be to God." I've been thinking about what Curtis said and he has become one of my theologians - the Word we hear proclaimed this First Sunday of Advent is the Word of the Lord. It's just not all of it. It is a word waiting to become flesh. It is a word waiting to be taken out into the streets and jails and households of our city. We're not meant to cozy up with God's soothing , 'May the Lord make you increase and abound in love for one another and for all.' We are meant to hear it so deeply that we move into areas where love seems to be in short supply. We are meant to hear God's word 'There will be signs in the sun, the moon, and the stars' so deeply that we can't help but be concerned about the destruction of this earth which is our sacred home. We are meant to be carrying our recent celebration of Thanksgiving so deeply that we realize the first Thanksgiving was about welcome of refugees...who had traveled a perilous trip across the water...in search of a better life. 400 years later, how can we not welcome the stranger when they get off the boat? 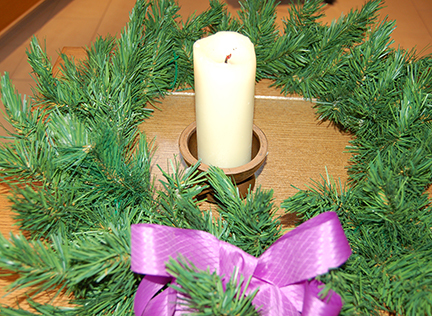 It's the First Sunday of Advent. A time of hearing deeply, responding courageously, and trusting that God is with us. Theologian Walter Brueggeman invites: What a stunning vocation for the church, to stand free and hope-filled in a world gone fearful and to think, imagine, dream, vision a future that God will yet enact. Or - as my theologian friend, Curtis, would say - you will know that the Word proclaimed is the Word of the Lord - just not all of it. That is for you and me to live forward.